A MUST see! Beautiful 1 story home, warm and cozy. - A beautiful home you will enjoy to live in. A must see 1 story property with electric gate at front entrance. Warm and cozy open floor plan with bricks and stone front entry elevation. Offers a large living and dining, big kitchen with white cabinets and granite counter tops, separate laundry room, 3 bedrooms and 2 baths. Energy efficient features with double panel windows, ceramic tile flooring, HVAC, water heater. The back yard is fully fenced with covered patio for family reunion and entertainment, 2 car garage. Easy access to Loop 12, I-35, and 67. It is near to schools, churches, shopping and recreational areas. Ready Now! Great location in Plano TX with PISD wi - Ready Now! Great location in Plano TX with PISD with Plano West Senior High. PISD: Hightower Elementary! This Home is Ready for a Quick Move-in. Offering 4 bedrooms, 3.5 baths and 3 car garage. Open floor plan, granite at kitchen with Stainless Steel appliances. Large formals, beautiful hardwoods and stone flooring. Over sized master at first floor, updated bath (granite, seamless glass shower, fixtures & hardware.) Energy efficient. Recently replaced high seer HVAC & roof, extra insulation, attic ventilation, utility room and covered patio. 4400 Barnsley is Centrally located within short distance from Schools, Shopping Centers, Restaurants, Malls and major employers. $45 application fee per adult. 8013 Deep Water Cove	McKinney, TX 75071 - MLS# 13930884 - Built by MHI Plantation Homes - CONST. COMPLETED Oct 31 ~ Upon entering you are welcomed by high ceilings and an open concept. Elegant hardwood floors at Entry, Extended Entry, Kitchen, Dining & Family Room. Oversized Master bedroom with spa like bath, and an enormous walk-in closet. This 3 bedroom, 2 bath home has a functional layout for family and entertaining, with an extra 2 feet extension at the 2-car garage. Enjoy family time out on the covered patio, and the serenity of Trinty Falls in this Plantation Leed energy certified home. 5209 Trail House	McKinney, TX 75071 - MLS# 13938795 - Built by Altura Homes - February completion! ~ Corner - This home is on a 1 acre corner lot!. It comes with gas appliances and a 3rd car garage. The 4th secondary bedroom was converted into a study. Extra white shaker style cabinets throughout the entire home with upgraded carpet in all the bedrooms. Wood floors in the entry, extended entry, dining, study, family room and hallway to secondary bedrooms. Subway tile on the kitchen backsplash with granite countertops and a stone fireplace..
A home that your family will love!Absolutely cha - A home that your family will love! Absolutely charming home in a great location at the Highlands Of Preston Ridge Subdivision in North West Plano. This home has been renovated offering a practical floor plan , 3 - car garage, master bedroom downstairs, a Junior suit at the second floor, 3 living areas, a gas cook-top kitchen and an over-sized corner lot with big a back yard and safe privacy fence to enjoy with family and friends. Plano ISD high rated schools. Convenient located near to AMC Stonebriar 24, Dave & Buster's, Cinemark West Plano, Adventure Landing, Studio Movie Grill, Whirlyball Laserwhirld, Movies 10, University of Texas at Dallas, Angelika Film Center & Cafe - Plano, Northbark Dog Park. 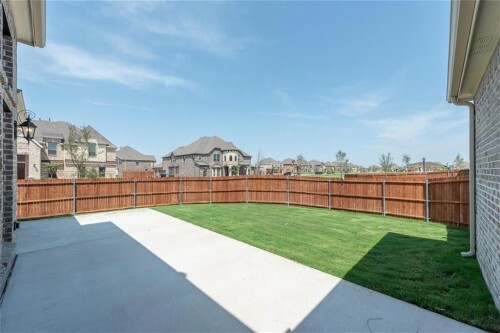 13018 Alvarado Lane	Frisco, TX 75035 - MLS# 13873536 - Built by First Texas Homes - Ready Now! ~ This popular Brenton floor plan features three bedrooms and two and a half baths downstairs. The exterior brick is accented with a stone; the garage is 2-car front entry. Inside you will find many custom upgrades including: a media room, added wrought iron rails at the gameroom to overlook the first level, a soaking tub placed in the master bathroom, a separate shower in the master, two living areas, tile, light, and cabinet additions, granite counter tops, wood floors, and more!!! Cozy up with the family around the fireplace. Entertain guests in the media room..
14132 Steadman Drive	Frisco, TX 75035 - MLS# 13948313 - Built by First Texas Homes - Ready Now! ~ REDUCED PRICE!! Originally $511,357 This exterior brick is accented with a stone; the garage is 2-car front entry. Custom upgrades include: a media room, added wrought iron rails at the gameroom to overlook the first level, separate showers in both downstairs bathrooms, a soaking tub placed in the master bathroom, tile, light, and cabinet additions, granite counter tops, wood floors, and more!!! Appliances in the home are Frigidaire professional series stainless steel appliances. Other amenities include energy saving tankless water heater, pre-wired security system, HomePro wired media room, covered patio, and a fenced backyard..